The affluent Dominique Ballard is made to believe she is becoming mentally unwell by her scheming husband. After her suicide, it appears Dominique wants him to join her in the afterlife. Film fans will know those familiar tropes. A sweet rich girl is married to a handsome man with villainous moustache and money problems. The rotter and scoundrel convinces her that she’s got mental health problems and in doing so, he gets control of her money. Well this film has all of these but with a twist or two up its sleeve. To see these plot devices late 1970s style, I suggest the film Dominique – also known as Dominique is Dead (1979) – with sweet rich girl played by Jean Simmons. Simmons an actress from those matriarchal, all-star mini-series roles of the 1980s. Be it her award-winning role in The Thorn Birds (1883) or the never-ending North and South Book I (1985) and Book II. Both these blockbuster TV mini-series, I do want to revisit one day preferably with my Darlin Husband riffing the former or explaining the historical facts the latter (as he does). Back to Dominique, in which Simmons has Cliff Robertson as her cad of a husband. And a spot the British supporting cast including Simon Ward, Jenny Agutter, Ron Moody, Judy Geeson and in a blink and miss it role, David Tomlinson – minus his moustache – from Mary Poppins (1964). Flora Robson plays the Meg Jenkins housekeeper role. This a British film which appears more from the opening credits to be like an all-star TV movie than a box office draw. The film begins with Dominique Ballard (Simmons), a fragile looking woman with a permanently, haunted (or haunting dependant on where you are in the movie) expression joining her husband at breakfast. He tells her indifferently from behind a newspaper (as husbands did in the UK 1970 TV and movies), the night before she fired their chauffeur. She can’t remember this but it seems it happened. To be honest, its hard to see it with Simmons’ Dominique appearing a quiet natured, placid and well-mannered woman who wouldn’t say Boo! to a ghost. Mr Ballard, husband David talks to his half-sister, Ann Ballard (Agutter) – suggesting a dinner party for his wife’s birthday, Ann is an artist and sculptor who lives nearby. At the dinner party, a guest Marjory (Geeson) recounts a time she thought she saw a ghost, getting all the Ballards’ attention. It also appears David’s business is in trouble and he desperately needs cash to save it. But none of these are important right now, but these facts all worth remembering..
During the dinner party, Marjory notices she’s mislaid a brooch. A fact which she suddenly remembers yelping this out just as Dominique cuts her birthday cake. Dominique again questions her memory as she finds said brooch on a dress in her wardrobe. All this commotion observed by her husband, who doesn’t seen too perturbed by them. David observing his wife’s distress from the shadows. Dominique plays the piano (a lot) which is reportedly her only joy , playing the same spooky tune repetitively. And the tune inevitably is the same one as in the opening score. As husband employs a new chauffeur, Tony. David tells Tony his wife had an accident his wife the year before. Why, when and what happened back then is a bit of a mystery, which sadly not explored in the movie. Soon after Tony is employed, Dominique begins to see things such as a person hanging from the conservatory roof and hearing her name called at night. Believing that she is being driven crazy by a possibly scheming husband, she asks Tony to help her. Tony, being ever the professional refuses. The ongoing stress of these incidents leading Dominique to hang herself the next night. She is pronounced dead by the local Doctor (Ron Moody). With her final requests to read her will about a week later on her wedding anniversary. And her buried with her favourite jewellery. After Dominique’s funeral, David’s seen lighting a cigar then smiling… Short of twirling his moustache and laughing like a mad man, these actions reveals he’s behind these “memory lapses” and spooky happenings. David then begins to question his sanity. Believing he hears his deceased wife playing that eerie tune on the piano, seeing her ghost walking toward him in her nightdress with her footsteps heard with her distinctive limp. This film played out more like an extended Alfred Hitchcock Presents (1965-89), Twilight Zone (1959-64) or Tales from the Unexpected (1979-88) episode than a cinema draw. It was more a suspense tale than a shocking horror. With more scenes played in pitch darkness than Solo : A Star Wars Story (2000). These certainly upped the fear and horror. With characters using torches, lighters and natural light and shadows to add to the suspense. We followed characters as they walked along dimly lit corridors or climbed up and down the stairs. These plot devices, made it reminiscent of The Innocents (1961). The scenes however slightly marred by the at times more silly second half with the film plot seeming to repeat itself, with now the husband hearing and seeing things. But with a few added unforseen twists. At times,,the film seemed also unsure of its sub-genre. With a scene seen from the doctor’s viewpoint, it turned into a slasher movie. This as the doctor suddenly attacked by an unseen pupertrator. and left for dead by this mysterious apparition. This occurred after the doctor seen packing for no apparent reason. A possible explanation for his packing assumed to be in unseen footage and explained as a number of Moody’s scenes cut from the film. The plot then reverting to more psychological horror and twists before the final reveal. It was clear there were a number of relevant scenes or character development missed from the final film. And possibly many of these scenes cut from the final movie figured with key members of the supporting cast. One can only imagine scenes that were missed out included those to flesh out those apparent supporting character’s roles from Moody, Agutter, Ward and all. This final cut making the film seem to concentrate too long on some characters, yet too short for others. With all this made blatantly apparent in the scene were the will read. Interestingly Imdb indirectly supports this reporting the director now claiming that he was not responsible for the editing. 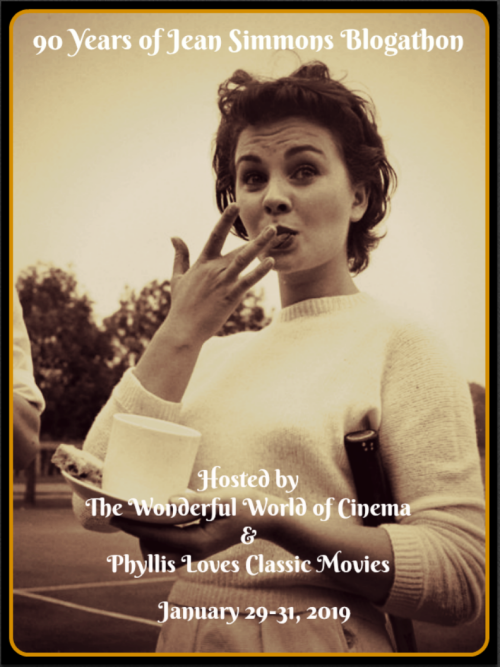 This film was entered into For the 90 Years of Jean Simmons Blogathon run by Phyllis Loves Classic Movies and The Wonderful World of Cinema, Other films with this cast include Jean Simmons in Divorce American Style, Alfred Hitchcock Presents, Hotel and Murder She Wrote. Jenny Agutter stars in The Eagle has Landed, Murder She Wrote, Magnum PI, Thriller and An American Werewolf in London. Simon Ward appeared in Lovejoy and Cliff Robertson adds his presence to Class. Ron Moody appears in Oliver and Judy Geeson in Carry on England. How could my beloved Cliff Robertson be so evil!! This sounds so good but also a little more than I can handle… Wonderful review! Thanks for participating in the blogathon! If you want to see him in a fun comedy, try the Brat pack film, Class. Another one that skipped my notice back in the day. Where do you find them?! Such fun to discover these movies. Yeah, I could live with an extended Hitchcock episode. Sometimes that is just what you need. That’s the best things about blogathons there’s just so many undiscovered gems out there. Great and well-detailed article Gill! This surely sounds like a chilling and suspenceful film! I’ve heard about it before but still have to see it. I love both Jean Simmons (duh!) and Cliff Robertson! Thanks so much for telling us more about it and for your participation to our blogathon! Thanks for having me, and letting me change my post to find this great movie. Love to hear your thoughts on it if you see it. No prob Gill! Btw, I had completely forgotten to tell you that, but last October (for Halloween!) I watched The Omen II that you made me discover with your post for the William Holden Blogathon. I really enjoyed it! I also watched the first one with Gregory Peck first. Chilling! Thanks, glad you liked it – Lee Grant is fantastic and those special effects are priceless. You must now try the third one with Sam Neill in it.